Berkeley’s own Patrick Landeza, Hawaiian slack key guitarist extraordinaire, returns to the Freight fresh on the heels of receiving Hawaiian music’s highest honor, the Na Hoku Hanohano Award for Slack Key Album of the Year. He is the first musician based on the mainland to win this award, informally known as the Hawaiian Grammy. A musician, composer, and producer, Patrick is a leading exponent of ki ho’alu, the Hawaiian slack key guitar style that Hawaiian cowboys developed in the 19th century when they loosened – or “slacked” – their guitar strings for a lower, more resonant sound. 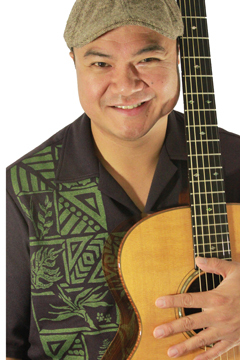 Born and raised in Berkeley to Hawaii-born parents, Patrick studied slack key from masters like George Kuo, Ray Kane, and Sonny Chillingworth. Patrick is not only one of the top slack key performers in the world, he is also a musical bridge between Hawaii and California – he plays, in his words, “traditional Hawaiian music with a Berkeley twist.” He first played at the Freight on Open Mic Nights, and now he says, “The Freight is and always will be my home.” The feeling is mutual. Please join us in welcoming Patrick home for an evening of inspired music and aloha spirit!